I watched Sunday's match and though I was cheering for the Dutch (my father is Dutch - hence my name, Broerse) I have to say Spain played a solid game. I'm getting over the reeling heartbreak of Roeben's fatal and tragic near-miss, that one beautiful attempt in the second half when he had that one breathtaking breakaway. But how am I recovering? Well, I'm drinking Torres' Viña Esmeralda, an excellent white Spanish wine from Catalunya. I figure this is the one true, less trying way of embracing the dreariness of defeat. I dearly love Spanish wine and I have to wonder what I might have written had Holland won. They are certainly not the wine-producing country Spain is with Heinekken as their flagship alcoholic beverage producer and distributor. I might be writing about Holland's beer king or the role the Dutch played in producing brandy (for another blog). Alas, here I am with my Spanish white, a blend of 85% Moscatel de Alejandra and 15% Gewürztaminer grown in the northeast of Spain. The wine has a bouquet of sun-kissed bananas, peaches, and pineapple. On the palate, you can taste the passion fruit, the kiwi and a minimal whisper of mineral and lime. It is off-dry and would be ideal with a summery fruit salad. Well, if you want to celebrate Spain's victory, you should chose a wine from the greatest bodega in Spain's modern wine history. Torres, for those who don't know the incomparable bodega is what you might call the Mondavi of Iberia. The story really begins several decades ago with Miguel Torres Carbó who took over the family firm in Vilafranca del Penedès in 1932 at the age of 23. During the Spanish Civil War, Torres Bodega was badly damaged by shelling. Despite the costs of reviving and rebuilding his winery in 1940, Torres knew the key to success existed in exporting. 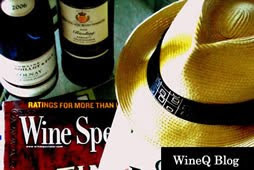 So with his wife Doña Margarita, the couple traveled throughout South America, the Far East and the Pacific Rim, Europe and North America in hopes of establishing contacts and gaining support for his dream of reviving the Spanish wine industry. He knew the export market after WWII was in rough shape. Europe and North America weren’t especially keen on importing wine from a country with a dictator holding the reigns. He found friends in Latin America and the Far East, where there was a much warmer reception. In the 1960’s, Torres was credited with the first installation of stainless steel fermenting vessels and holding tanks in Spain. His journeys introduced him to the technologically savvy techniques from both the New and Old Worlds, ultimately choosing oak barriques to age his finest wines and the temperature controlled tanks to produce his quality everyday wines. He also imported and incorporated other French and European grape varities into his vineyards. It is because of him we find Chardonnay, Cabernet Sauvignon, Riesling, Gewürztraminer growing amongst Spain's Tempranillo, Monastrell, Carignan and Garnacha. With the rise of tourism in the 1960’s and 70’s, Torres name stood at the forefront both abroad and in his homeland. In 1991, Torres passed on, leaving the family business to his son and present owner, Miguel A. Torres. Waltraud Maczassek, whom he married in 1962, a German artist lends her name to the Riesling of the Torres line. Torres has vineyards in both Chile’s Curico Valley and California’s Sonoma. It is rightly believed that a World Cup victory can mean a boost in morale for a country. Spain's economy is presently shaky. If anything, the win is a glorious, golden gift for the hard working men and women of Spain. I hope the victory celebrations slip on continuously throughout the nights. I pray the country recovers from its economic woes and wins the world over again. To this, I raise a glass and savour the salud before bed.